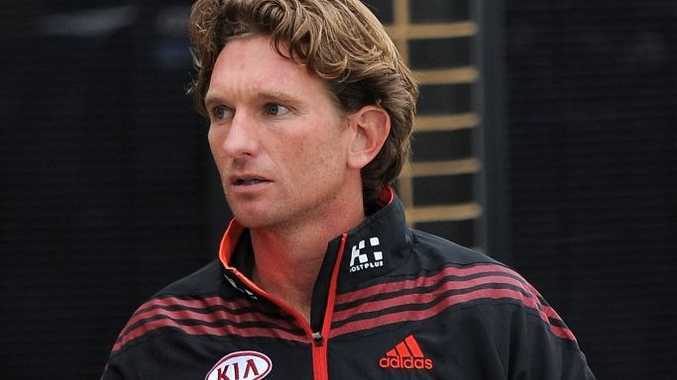 THE Essendon Football Club will not play in the AFL finals this year and its coach, James Hird, has been banned from the competition for 12 months. The club's football manager, Danny Corcoran, has been suspended for six months, with two months of that withheld, and senior assistant coach Mark Thompson has been fined $30,000. The Bombers have been banned from the first two rounds of this year's AFL draft and will also lose picks in the first two rounds of the 2014 draft for their part in bringing the game into disrepute over the supplements scandal that has rocked the AFL competition this year. A $2 million fine has also been handed to the club, the biggest penalty in the league's history. AFL Commission chairman Mike Fitzpatrick announced the punishments on Tuesday. Essendon will officially finish the season in ninth place but will still get an end of round one selection in the 2014 draft, and can trade back into both the 2013 and 2014 drafts. Hird's ban became effective as of last Sunday, paving the way for him to return as coach for next season's finals. His ban expires on August 25 next year and and he cannot have an official role with his club until then. Club doctor Bruce Reid has decided to contest his charge and will face the AFL at 10am on Thursday.